Policy at the altar of "public opinion"
Does economic policy matter? At first blush, the question might look disingenuous, even cynical. But let us dwell upon it for a while before we dismiss it. After all, there are plenty of instances in history where national economies appeared to do pretty well, by some measure, in the absence of what might be called national economic policy or under policies that in the end turned out to be the wrong ones to follow. Brazil, for example, grew rapidly in the 1960s and 1970s, and it is far from clear whether this was the result of a set of consistent economic policies. Some fortuitous factors, such as a buoyant world economy and high commodity prices and a reckless expansion of government expenditure, played their part. Or, perhaps more importantly, African countries grew surprisingly rapidly in the 1960s, and even in the turbulent 1970s. This was very largely the result of a boom in world commodity markets. Economic policy played little part. In fact, some of the policies that were in vogue at the time were to haunt these economies and drive them down the slope of disaster soon enough. One can even be legitimately cynical and suggest that sometimes an economy grows, not because of some national economic policies, but despite them. It should be easy to find instances to support that conclusion. Yet, economic policy does matter. Brazil's economic miracle did not last and Africa paid a terrible price, beginning in the early 1980s, for the absence of policy in a sharply hostile international environment. Contrast this with the economic performance of some Asian countries which faced just about the same international environment but grew rapidly. In fact, the case for good economic policy has gained acceptance in recent years. It is generally agreed that fiscal prudence is important for sustained economic growth. And this is often accepted even by those who beat their chests at the thought of such policy being too close to the IMF or the World Bank way of thinking. Few governments nowadays can afford to disavow reduction of fiscal deficit as a major goal of policy. Neither is a government budget complete without a declaration to fight inflation embedded in it. Most governments today also wish to be seen as champions of an open trading system, and pay at least lip service to reduction of national trade barriers as a major instrument of economic policy. Economic policies, whether macroeconomic such as the ones mentioned above, or sectoral like the one discussed below, are never uni-dimensional, simple to formulate, or always easy to implement. The impact of policies on individual sectors of production is not the same, and the various segments of the society are not affected in the same way. That makes policy formulation a complex exercise. The essential need for transparency does not make it any easier. To add to the complexity of economic policymaking, circumstances change and policies have to change too. This, surely, is no place for the naive. It is against the background of these complexities, and the responsibility of the government in the formulation of policy, that the issues of coal mining at Phulbari, and the implications of the events in the area in late August, should be examined. It will be seen that much that has been said in opposition to the project is dogma, while policy-makers themselves seem to have relinquished their responsibility for policy-making. The idea of mining for coal in the district of Dinajpur has a long history. The former East Pakistan Industrial Development Corporation proposed a large project as early as the mid-1960s. A cost-benefit analysis of the project showed significant expected net benefit for the economy of the country. The present phase of thinking on mining coal in the region is itself fairly long, and a project for mining at Phulbari was contracted out to a foreign company, BHP, in the early 1990s. Asia Energy was awarded the contract as early as 1998, but mining has not started yet. It appears as though those involved in the project, notably the policy-makers, have been living in a timeless present. To quickly go over the major features of the project envisaged by Asia Energy: the company estimates the amount of coal reserves to be about 570 million tons. It lies deep under the land in a populated area. The land is fertile and yields three crops a year. The mode of coal extraction was to be open-pit mining. Perhaps some 6,000 hectares of this land would need to be taken over for mining. The number of people needed to be relocated (in the parlance of those in favour of the project) or evicted (to those who oppose it) is said to be of the order of 40,000, according to Asia Energy, considerably higher according to the opponents of the project. Some 15 million tons of coal will be mined annually once the project goes into full production. Much of the coal, perhaps 10 million tons, would be exported, as the domestic market was unlikely to be more than 4 or 5 million tons, according to Asia Energy estimates. Bangladesh would get a 6 percent royalty on the value of production. Asia Energy estimates the total benefit to the economy at around $21 billion over the life of the project, of which about $8 billion is direct benefit and about $13 billion in indirect benefits accruing through linkages to other sectors of production. The project would contribute some $600 million annually to the balance of payments of the country. The environmental impact of the project will undoubtedly be considerable, but Asia Energy considers the problem manageable. Not everybody was impressed. Opposition to the project began to build up soon after Asia Energy began exploratory work in the region. A local citizens' resistance committee, the Phulbari Protection Committee, was soon formed, but opposition was spearheaded by a National Committee to Protect Oil, Gas, Mineral Resources, Power and Port, a national citizens' group. The title of the committee probably sums up its message. For Phulbari, the Committee, whose members are drawn from the intelligentsia of the country, has acted as the main intellectual forum that many people in the area looked up to. Regarding the nature of the project that Asia Energy was about to embark on, the National Committee is in no doubt: the project is anti-people and anti-environment. The Committee, in fact, considers all foreign direct investments and their purveyors, the multi-national corporations, predatory. In its assessment, the project will ruin the lives and livelihood of hundreds of thousands of people who would be evicted from their homes, bring environmental disaster to a large area of the country, and rob the nation of a valuable natural resource. Asia Energy would, on the other hand, make huge profit through plunder. The Committee sees no good in the scheme at all. It would rather wait till indigenous capacity to mine coal has been developed, in which case national sovereignty on natural resources would be protected and the benefit of mining would accrue entirely to the nation, without the need to share it with some foreign predators. 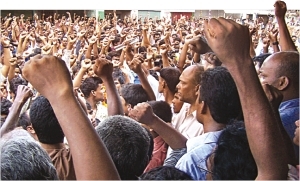 Mass agitation against the project began in March. The "Phulbari Declaration" adopted after a mass demonstration on March 25, rejected the project as anti-people, and vowed to "never let our lives and property be sacrificed at the altar of racketeers' profit scheme." On behalf of the people of Phulbari, the National Committee was soon to declare a people's victory. The victory came in the wake of days of agitation in late August in which lives were lost. On August 26, thousands of people marched in Phulbari "to say No to AEC's big open-pit mining (OPM) project. People wanted to give a strong message to AEC that they were unwanted in the region, and also in the country." 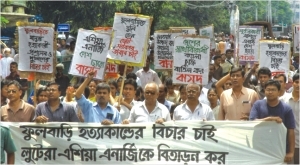 A declaration adopted at the march said: "Since Phulbari coal project is an arrangement to take away coal resources from the people to hand over to a foreign company, and since OPM, a profitable means for coal extraction for the company, would destroy the region and would create a disaster for the people's lives and livelihood, we are hereby declaring the people's verdict that we do not want a project that would destroy our lives, ecology, and livelihoods." This is truly amazing. The parties to the "agreement" were the mayor of the city of Rajshahi, and the National Committee to Protect Oil, Gas, Mineral Resources, Power and Port. The mayor, whose city, far from having jurisdiction over Phulbari, is not even contiguous with that area, and which is, in fact, situated in an altogether separate administrative district, signed the document, apparently on behalf of the Government of Bangladesh. The signing was done in the presence of a deputy minister (for food and disaster management) of the Government of Bangladesh and the deputy commissioner of Dinajpur, which fact presumably bolstered the claim that the deal had the backing of the government of the country. The fact remains, however, that the mayor, who is not empowered to make policy decisions at the national level and whose action was almost certainly prompted by electoral considerations, signed the agreement as a leader of the political party in power. Leaders at the highest levels of government have said very little about the agreement, not in public anyway, presumably for the same reason. A critical policymaking responsibility of the government had thus fallen victim to populism and political expediency. A great deal can, of course, be said on the economics of the project. While the estimates of costs and benefits of the project presented by Asia Energy may be a little too neat, those offered by its opponents would appear to be far from convincing to many. It suffices here to point out that a national enterprise for coal mining at Phulbari would still need to export the coal (that is send a valuable natural resource abroad) and make a decent return on its investment, assuming of course that it can find the capital and the technology needed to implement the project. But the issues of policy-making we are concerned with here are relevant, irrespective of whether or not Asia Energy's project deserved support. The question of the environment remains highly important. The opponents of the project have painted a picture of horrendous environmental degradation of Phulbari and its surrounds as a result of the project. The government has, however, already given Asia Energy the environmental clearance. One hopes that this was done after a very thorough investigation. But then, does not the so-called agreement that bans all open-pit mining in the country contradict government policy? If a well thought out policy -- which one believes lay behind the environmental clearance -- was to be nullified by an agreement of this nature, what confidence might investors, local or foreign, have in national policy-making? But there are other issues of policy-making which are hardly less important. In a democratic country, the opinion of the people is paramount. It is said that the people of Phulbari did not want the project. The economics of the project does not, of course, depend on what people think of it, and neither does the environmental impact of the project. But they certainly have a say in the matter of relocation. One of the National Committee's main objections to the project is that a large number of inhabitants of the area will be displaced. How does the policy-maker figure out whether an individual is willing to be relocated? If I were to ask a poor farmer of the area: "We would like to evict you, what do you say?" he will certainly say "No," and will probably garnish his reply with some choice words, and rightfully too. If he were told that he would be relocated but will be amply compensated, he would probably agree to be moved, even though he would be sorry to leave his ancestral home. If he were told that the change would be accompanied by no great harm to his environment, he would probably even be happy. These are critical pieces of information on which he would like to base his decision. Have they been made available to him at Phulbari? Or was the National Committee, which had already determined that all foreign investments were predatory, speaking for all the people of Phulbari in the matter? From newspaper reports we gather that Asia Energy did mount a campaign of information. If the company had been indulging in lies and deceptions, as the National Committee alleges it had, should not national policy-makers have been giving the people the information they needed? That was an essential part of policy-making in the present case. Relocation is often inevitable in the process of economic change. It has been taking place throughout the economy, as factories go up on arable land, or as highways are constructed and bridges built. The construction of the bridge over the Jamuna involved a significant relocation of inhabitants in its approach areas. The Karnaphuli hydro-electricity project displaced a substantial number of inhabitants of the area. The number of people involved in Phulbari is admittedly large. But a little less emphasis on dogma and the ills of the project, and a little more attention to its benefits, would probably have led to a more rational decision. There are groups of the intelligentsia who, while seeking to mould public opinion, often claim to speak for the country. Their intentions need not be in doubt. But many of its members have often been found wallowing in the past. Some three decades ago, economists of left-wing persuasion poured scorn on the idea that development of a ready-made garments industry could be at the forefront of a successful export-oriented industrialization policy of the country. They have been proven wrong, the present difficulties in the industry notwithstanding. Their thinking was stuck in the past, while a rapidly globalizing world economy passed them by. Foreign direct investment and the multi-national corporations were once the bogey in many developing country and debates raged in international forums on how to curb their supposedly pernicious influence. Things have changed over the past couple of decades, and FDI is eagerly sought in just about every country in the developing world. It is a pity, therefore, that at Phulbari the old bogey was resurrected. Policy-making, it seems, has not kept pace with the times. Whether or not Asia Energy's investment proposal would have been a sacrifice of national well-being at the altar of foreign interest, economic policy-making has certainly been sacrificed at the altar of "public opinion" at Phulbari. 1. Brian Mooney, Separating the Myths from the Facts about Phulbari, The Daily Star, February 20, 2006. 2. Anu Muhammad, Phulbari and the People's Verdict, The Daily Star, September 24, 2006. Mahfuzur Rahman is a former United Nations economist.